It’s been established that Mario Tennis Aces is definitely a fighting game, so like any good fighting game, players have come to despise its strongest character. Unfortunately, that character isn’t someone cool like Street Fighter’s Cammy or Dragon Ball FighterZ’s Cell. No, the most powerful member of the Mario Tennis Aces roster is freaking Bowser Jr.
Mario Tennis Aces has only been out for a couple of weeks, but players’ hatred for Bowser’s spawn has reached a fever pitch. The central subreddit has filled with anti-Bowser Jr. threads since the game’s release. While some users simply ask for ways to counter the tiny athlete, others openly refuse to face Bowser Jr. players they match up with in online competition. Mario Tennis Aces classifies each character under one of six archetypes: All-Around, Technical, Speedy, Powerful, Defensive, and Tricky. As the only other Defensive character, Waluigi enjoys many of the same gameplay benefits, but Bowser Jr.’s particular cocktail of skills and innate talent for building super meter make him a much bigger problem. Accel noted that the character has “good angles” on his shots, allowing him to easily put a ball outside the opposing character’s range. Bowser Jr. can also drift towards an incoming shot as he charges up without losing much speed, a trait shared by fellow hovering characters like Boo and Rosalina. And if you do manage to get a ball past Bowser Jr., all he needs to do is use Aces’ comeback Trick Shot mechanic to easily return the ball and get back in the game. A future balance patch may come at some point from either Mario Tennis Aces developer Camelot Software Planning or publisher Nintendo, according to a small bit of text at the bottom of the last update noting that “there will be further adjustments to game balance in matches and character performance.” Until then, players will need to find a definite way to counter Bowser Jr., pick up the character themselves to remain competitive, or perhaps even ban him altogether. 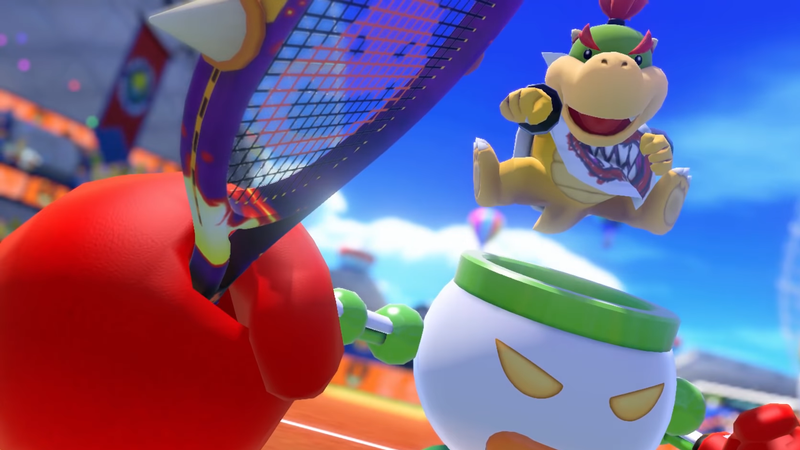 A Mario Tennis Aces tournament organizer has planned a ‘suspect test’ for July 7 to run Bowser Jr. through his paces and decide how to proceed. The situation does have one upside: hatred for Bowser Jr. has expedited competitors’ natural learning process.